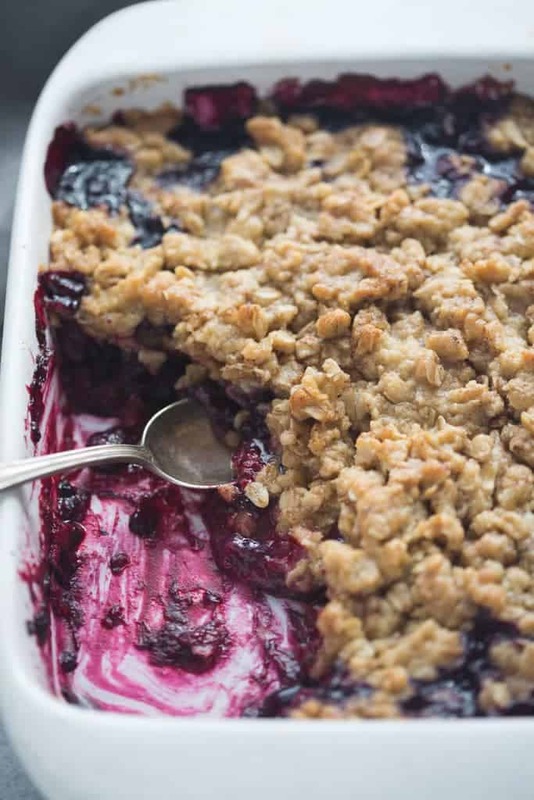 The easiest Triple Berry Crisp made with frozen raspberries, blueberries and blackberries for a juicy berry filling nestled under a crispy oat topping. So it turns out that ya’ll love fruit crisps just as much as I do! 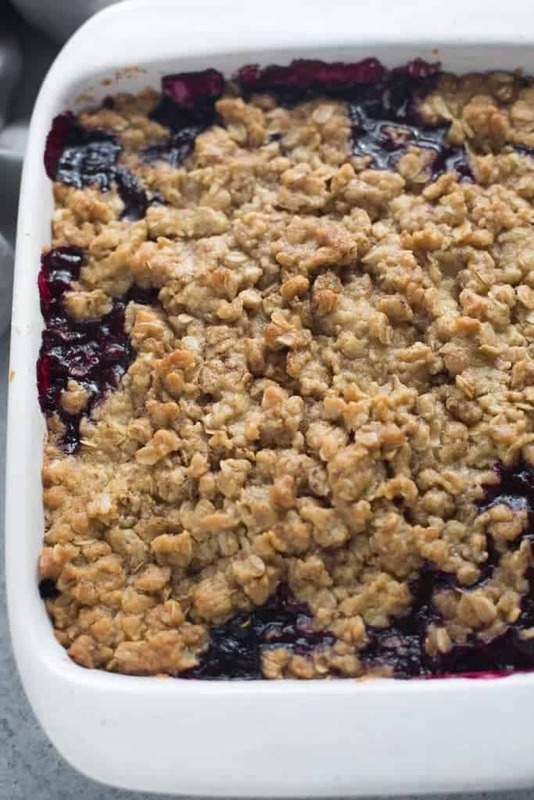 Some of my most popular recipes are my BEST EVER Apple Crisp and my Peach Crisp, so I knew it was definitely time to share this delicious Triple Berry Crisp with you all! This would be perfect for Thanksgiving dessert, since it’s just as tasty as pie but a lot easier and less time consuming to make. For the filling, I use these big beautiful frozen berries you see above. They’re the 3-berry pack in the frozen section at Costco and the price is unbeatable. They are the biggest, nicest frozen berries I’ve ever seen. I love how easy fruit crisps are to make. This one has the same flavors I love from my Triple Berry Pie, but it’s even easier to make. Perfect for any type of baker, even the most amateur. I’ve thickened the filling slightly so that it holds together and isn’t a runny mess when you’re serving it. The oat crumble on top is insanely delicious. It bakes up all beautiful, golden and crispy and is the perfect contrast to the sweet, juicy, warm berries. It’s perfect for serving a crowd, especially with a scoop of vanilla ice cream! Bake and cool the crisp completely, then cover it with a double layer of aluminum foil. Freeze for up to 3 months. Thaw overnight in the refrigerator, then warm in a 350°F oven for 20-25 minutes or until heated through. I don’t suggest preparing the crisp and storing it, unbaked, in the fridge because the topping will get soggy. 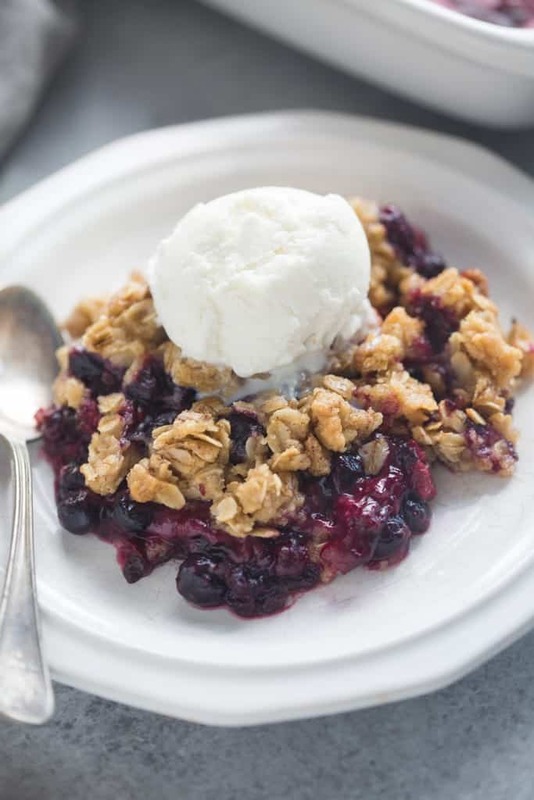 The easiest Triple Berry Crisp made with frozen berries for a juicy berry filling nestled under a crispy oat topping. Make the topping first by combining the oats, flour, sugar, brown sugar, cinnamon and salt. Stir to combine. Pour in the melted butter and stir to incorporate. Set aside. 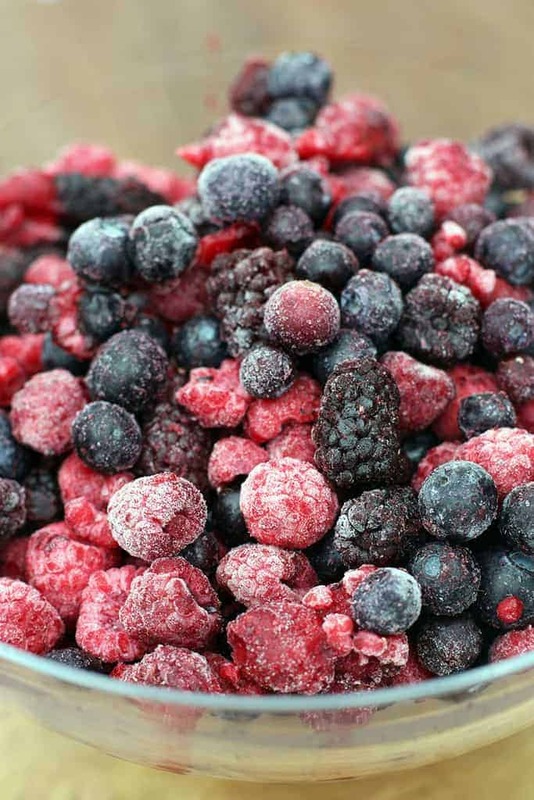 In another bowl add the frozen berries, flour, sugar, salt, lemon juice and vanilla extract and toss gently to combine. Pour mixture into an 8x8’’ or similar size casserole dish or pie plate. Glob the topping ingredients evenly over the top (I say “glob” because the mixture will be softer than your normal dry crumble topping, because of the melted butter). Bake for 40-45 minutes until the topping is golden brown and berries are bubbling around the edges. Remove from the oven, place on a wire rack, and allow to cool for at least 7-10 minutes before serving. Serve with a scoop of vanilla ice cream, if desired. Cover leftovers and store in the refrigerator for up to 5 days. You might also love easy homemade apple crisp! *I use the Costco, Kirkland brand of frozen berries called “Three Berry Blend” that includes blueberries, blackberries and raspberries. *You can use fresh berries, but you may need to cut down on the baking time by at least 5 minutes. Tips for making ahead and freezing are listed in the post above! I am excited and anxiously waiting for the oven buzzer to go off. Hoping it turns out great, as I am taking to a potluck at work. I am using my fresh picked tart cherries, blueberries & raspberries that I hand picked them froze. Can’t wait!! Thank you Sara–I’m really to happy you’ve enjoyed it, and I love hearing your additions! I chose this recipe as I liked the concept of melted butter rather than cold butter, as it’s hard to rub cold butter into a topping largely composed of oats. I omitted the granulated sugar, as I thought it would be too sweet. Unfortunately, it was still far too sweet for my taste and although I threw in more salt to take the edge off, it just didn’t make the grade. I’ll go back to my other recipe. Mine came out soupy, is there a way to avoid this? I agree with Bryn it turned out soupy so I had to gently remove the topping what was left and cook the filling till it thickens and used another recipe for the topping. And it is super sweet. Depending on the brand of frozen berries you used (I use the costco brand), their water content can be really different. The solution is to add more flour, or a little cornstarch (around 1 tablespoon). Is it 558 calories per serving or for the whole pan? Hi Ele, I double checked the nutrition information and it is reestimated at 500 calories per serving, assuming six total servings. It is made in an 8 x 8 dish and could easily serve 9 people making it just over 300 calories per serving.